Equipped with a 570hp twin-turbo 3.8-liter V8, the McLaren 570S Spider offers the same sort of performance potential as its Sports Series stablemates. It retains the sporty demeanor of the 570S with the added dimension of an electrically retracting roof section. Standard specifications are comprehensive and include Carbon-ceramic brakes and adaptive suspension but the available sports exhaust and nose lift system are well worth it too. Customers seeking a little individuality can choose from a range of paint and interior options as well as numerous Carbon-fiber aero add-ons. 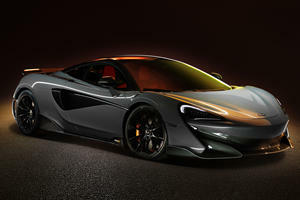 The Sports Series offers an entry point into McLaren ownership and in the United States has up until recently comprised of the hardtop 570GT and 570S models. Those wanting wind-in hair motoring can now also look at the 570S Spider, a new entrant it offers the hard-edged thrills of the 570S with a powered removable hardtop section. The 570S shares its interior with the 570S and offers a minimalistic cockpit design and a pair of ergonomically designed sport seats. Those wanting more lateral support can chose from more aggressively bolstered options. The upward opening dihedral doors remain and make it a bit easier to slide into the low seats. The center of the dashboard is dominated by a vertically mounted touchscreen and the general fit and finish and switchgear quality is as one would expect of a McLaren. The materials that the cockpit, doors and seats are covered in are all up to the customer and include a mix of leather, Alcantara and carbon fiber in numerous colors. You will have to fly light though as there is not much space for carry-on luggage other than for a pair of sunglasses and your wallet. The front trunk is tiny too so checked baggage too will be limited to a squishy bag or two. With a very stiff carbon-fiber based chassis, the 570S Spider needed no additional reinforcement and the slight increase in weight is down to the power mechanism for the removable roof. Driving dynamics remain razor sharp and the 570S Spider carves up a mountain road with the same exuberance as the coupe. The standard Carbon-ceramic brakes provide fade-free stopping power but are a little devoid of feel compared to the setup in competitors like the Ferrari 488. The steering feel though is great and whether you are blasting along at maximum attack or just cruising down a country lane, the 570S Spider offers a level of feedback that is increasingly rare in today’s digital supercars. The removable roof section takes 15-seconds to retract and adds another dimension to the driving experience, at sub-highway speeds the exhaust noise is more noticeable in the cabin too. The ride remains firm in most settings but only really rough road surfaces upset the cars composure and while the 570GT offers a softer setup the sportier S is no hard-as-nails racer either. The 570S Spider comes equipped with the same 3.8-liter twin-turbo V8 that is found in the rest of the 570 Sports Series cars. This means 570 horsepower and 443 lb-ft of torque. 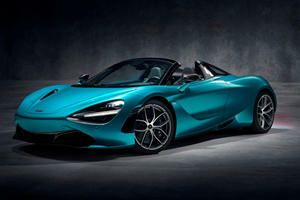 The 7-speed dual-clutch transmission and rear-wheel drive layout reman too and according to McLaren the 0-60mph time is still a very rapid 3.1-seconds. The 204mph top speed remains identical to the coupe though as long as the roof is kept in place. There is no doubting the 570S Spiders’ performance credentials as it lunges towards the horizon, however the revs do need to be kept up to extract the best from the engine. The 570S Spider comes in one trim level that covers all the basics and then some. A few of the more notable standard features include LED lighting all-round, 7-inch touchscreen with navigation and smartphone integration, Bluetooth audio streaming, a rearview camera and Wi-Fi tethering are also part of the base package. Staggered 19-inch front and 20-inch rear alloy wheels as well as Carbon-ceramic brakes and adaptive suspension aid performance levels and an available sports exhaust, 12-speaker audio system, nose lift system and soft-close doors are a few of the many options to choose from. 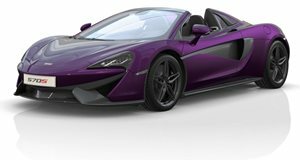 There are a large range of interior and exterior customization options as well as a couple of carbon-fiber packages and for a truly bespoke feel, the MSO (McLaren Special Operations) division will paint and trim your 570S in just about any color and fabric you desire. The McLaren 570S Spider may be a junior supercar but don’t let that fool you in thinking it is anything but extremely rapid. The addition of the powered roof has little noticeable effect on the 570S’ dynamic capabilities and the many available options allow for real customizability. Each body color represents a specific moment in McLaren racing history. When exactly? That remains a mystery but we do have a good guess.